At Hotels Fairy we always want to make holidays a happy and magical experience. 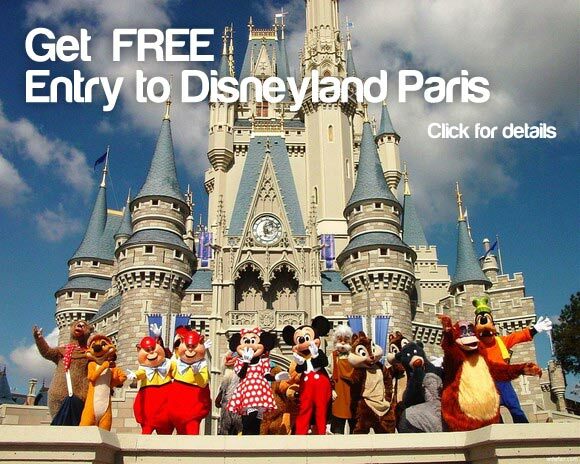 That’s why this month we’ve found you FREE entry to Disneyland Paris and some bargain deals on hotels near to the Disneyland Paris park. If you’re travelling to France by car this summer, P&O Ferries are offering you a free ticket to Disneyland Paris with every car booking, Dover to Calais! If you want to stay right at the entrance to Disneyland then the best value hotel on the park perimeter is the Kyriad Disneyland Resort Hotel, with double rooms from €85 per night. However, if you want a real bargain, visit one of the nearby towns or villages just a few minutes by car from Disneyland and you’ll save a fortune. Here’s the best value hotels within 20 minutes of Disneyland Paris. This 3 star modern hotel is right on the border of Disneyland, but on the opposite side from the entrance, meaning that you save €30 per night or more for being literally a 2 minute ride away. If you want to be first in line when the gates open, then this is the bargain hunters top choice. Torcy is 12km from Disneyland in the direction of Paris and has an RER rail station from which you can travel to Paris and Disneyland. Hotel Mister Bed is inside an entertainment complex containing over 100 shops, 12 restaurants and a 16 screen cinema, so you’ll have non-stop entertainment. This is the cheapest hotel you’ll find near to Disneyland Paris, at just €37 for a room that sleeps 3 people. It may not be luxury, but you’ll get a good nights sleep and have plenty of money to enjoy in the park. Now there’s no excuse not to take the kids to Disneyland. As always, our hotel price comparison system will help you find the best hotel deal.